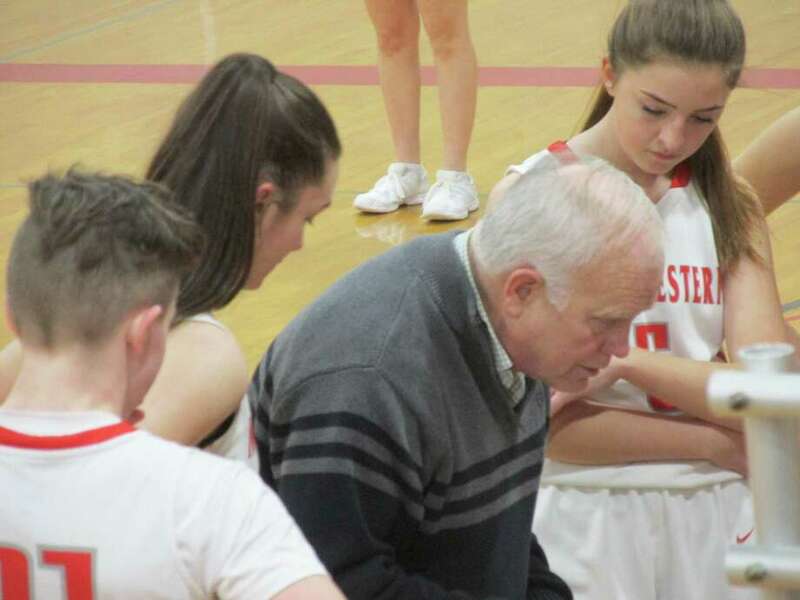 Northwestern coach Fred Williams maps the strategy for another Highlander victory, this time over Wamogo at Northwestern High School Tuesday night. WINSTED — Defending Berkshire League girls basketball champion Northwestern’s 56-25 win over Wamogo at home Tuesday night was less a game for both teams than a study of what the Highlanders (10-1; 8-1 BL) do right and what the Warriors (3-8; 2-7 BL) might aspire to. “The kids buy into whatever we’re asking them to do,” said veteran Northwestern coach Fred Williams, whose teams contend for Berkshire League titles and more every year. Northwestern’s sole loss halfway through the regular season came at undefeated Housatonic 57-52 on Jan. 2. Tuesday was a chance to work on it. A three by Wamogo’s Sammy Brady earned the only Warrior lead early in the game. Then Northwestern’s loose press and half-court ball-hawking went to work. Emma Propfe (game-high 15 points), Northwestern’s only senior starter, made the first of her four steals, cashing it in on a three-point play. Seconds later, junior guard Skylar DiMartino (14 points, 3 steals) upped the adrenaline with an end-to-end race to the hoop for the second of 24 Highlander baskets without a three-point shot. “If we’re not shooting well, we concentrate on screening for each other,” DiMartino said. Junior forward Jana Sanden (7 rebounds) followed with another Highlander steal and the rout was on in points and adrenaline. Wamogo’s Lexi Weik and Paige Mitchell battled for a combined 15 rebounds, but scoring was a Highlander avalanche. Propfe made the next two baskets, sandwiched around a DiMartino steal. Junior forward Natalie Lederman (10 points) finished the quarter with four straight baskets underneath, interrupted only by a corner three by Wamogo’s Mitchell. “They’re spreading you out and then they’re isolating you,” Stolle said at the half. “We’re cooperating and working together as a unit,” Lederman said. The score was 19-6 at the end of the first period and only got worse for the Warriors until Williams cleared his bench in the final period. For Stolle and her team, lessons are one thing, making them stick is another. “We work on basketball all the time,” Lederman said. Wamogo plays Northwestern again in the last game of the regular season, two days after the Highlanders have another crack at Housatonic, this time at Northwestern. Lexi Weik 0-2-2; Paige Mitchell 3-0-8; Sammy Brady 1-0-3; Cassidy Wilson 1-2-4; Justine Lago 3-0-6; Rita Dziedzic 1-0-2; Totals: 9-4-25. Frankie DeSanti 0-1-1; Natalie Munson 1-0-2; Skylar DiMartino 5-4-14; Emma Propfe 6-3-15; Emily Muson 2-0-4; Harley Jasmin 2-0-4; Natalie Lederman 5-0-10; Jana Sanden 3-0-6; Totals: 24-8-56. 3-point goals: W — Mitchell 2; Brady.